1 A None No Power Seat 1 A is a standard Business class seat that has slightly restricted legroom due to the bulkhead. The tray table is in the armrest, making the armrest immovable and slightly reducing seat width. There is no floor storage during takeoff and landing. The proximity to the galley may be bothersome. 1 B None No Power Seat 1 B is a standard Business class seat that has slightly restricted legroom due to the bulkhead. The tray table is in the armrest, making the armrest immovable and slightly reducing seat width. There is no floor storage during takeoff and landing. The proximity to the galley may be bothersome. 10 A None No Power Seat 10 A is a standard Economy class seat that has extra legroom due to the exit. The tray table is in the armrest, making the armrest immovable and slightly reducing seat width. There is no floor storage during takeoff and landing. 10 B None No Power Seat 10 B is a standard Economy class seat that has extra legroom due to the exit. The tray table is in the armrest, making the armrest immovable and slightly reducing seat width. There is no floor storage during takeoff and landing. 10 C None No Power Seat 10 C is a standard Economy class seat that has extra legroom due to the exit. The tray table is in the armrest, making the armrest immovable and slightly reducing seat width. There is no floor storage during takeoff and landing. 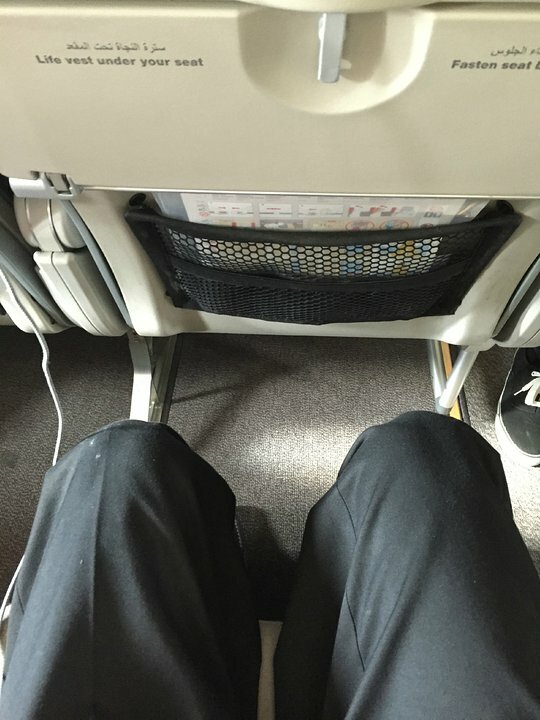 10 G None No Power Seat 10 G is a standard Economy class seat that has extra legroom due to the exit. The tray table is in the armrest, making the armrest immovable and slightly reducing seat width. There is no floor storage during takeoff and landing. 10 H None No Power Seat 10 H is a standard Economy class seat that has extra legroom due to the exit. The tray table is in the armrest, making the armrest immovable and slightly reducing seat width. There is no floor storage during takeoff and landing. 10 J None No Power Seat 10 J is a standard Economy class seat that has extra legroom due to the exit. The tray table is in the armrest, making the armrest immovable and slightly reducing seat width. There is no floor storage during takeoff and landing. 2 H None No Power Seat 2 H is a standard Business class seat that has slightly restricted legroom due to the bulkhead. The tray table is in the armrest, making the armrest immovable and slightly reducing seat width. There is no floor storage during takeoff and landing. The proximity to the galley may be bothersome. 2 J None No Power Seat 2 J is a standard Business class seat that has slightly restricted legroom due to the bulkhead. The tray table is in the armrest, making the armrest immovable and slightly reducing seat width. There is no floor storage during takeoff and landing. The proximity to the galley may be bothersome. 23 A None No Power Seat 23 A is a standard Economy class seat in the last row of the plane. This seat has limited recline due to the bulkhead wall behind. The close proximity to the lavatories may be bothersome. 23 B None No Power Seat 23 B is a standard Economy class seat in the last row of the plane. This seat has limited recline due to the bulkhead wall behind. The close proximity to the lavatories may be bothersome. 23 C None No Power Seat 23 C is a standard Economy class seat in the last row of the plane. This seat has limited recline due to the bulkhead wall behind. The close proximity to the lavatories may be bothersome. 23 G None No Power Seat 23 G is a standard Economy class seat in the last row of the plane. This seat has limited recline due to the bulkhead wall behind. The close proximity to the lavatories may be bothersome. 23 H None No Power Seat 23 H is a standard Economy class seat in the last row of the plane. This seat has limited recline due to the bulkhead wall behind. The close proximity to the lavatories may be bothersome. 23 J None No Power Seat 23 J is a standard Economy class seat in the last row of the plane. This seat has limited recline due to the bulkhead wall behind. The close proximity to the lavatories may be bothersome. 7 A None No Power Seat 7 A is a standard Economy class seat that has slightly restricted legroom due to the bulkhead. The tray table is in the armrest, making the armrest immovable and slightly reducing seat width. There is no floor storage during takeoff and landing. 7 B None No Power Seat 7 B is a standard Economy class seat that has slightly restricted legroom due to the bulkhead. The tray table is in the armrest, making the armrest immovable and slightly reducing seat width. There is no floor storage during takeoff and landing. 7 C None No Power Seat 7 C is a standard Economy class seat that has slightly restricted legroom due to the bulkhead. The tray table is in the armrest, making the armrest immovable and slightly reducing seat width. There is no floor storage during takeoff and landing. 7 G None No Power Seat 7 G is a standard Economy class seat that has slightly restricted legroom due to the bulkhead. The tray table is in the armrest, making the armrest immovable and slightly reducing seat width. There is no floor storage during takeoff and landing. 7 H None No Power Seat 7 H is a standard Economy class seat that has slightly restricted legroom due to the bulkhead. The tray table is in the armrest, making the armrest immovable and slightly reducing seat width. There is no floor storage during takeoff and landing. 7 J None No Power Seat 7 J is a standard Economy class seat that has slightly restricted legroom due to the bulkhead. The tray table is in the armrest, making the armrest immovable and slightly reducing seat width. There is no floor storage during takeoff and landing. 9 G None No Power Seat 9 G is a standard Economy class seat that may have limited recline due to the exit row behind. 9 H None No Power Seat 9 H is a standard Economy class seat that may have limited recline due to the exit row behind. 9 J None No Power Seat 9 J is a standard Economy class seat that may have limited recline due to the exit row behind. Royal Jordanian offers Audio and Video onDemand, which has audio, video, and gaming. This system is available to all passengers. 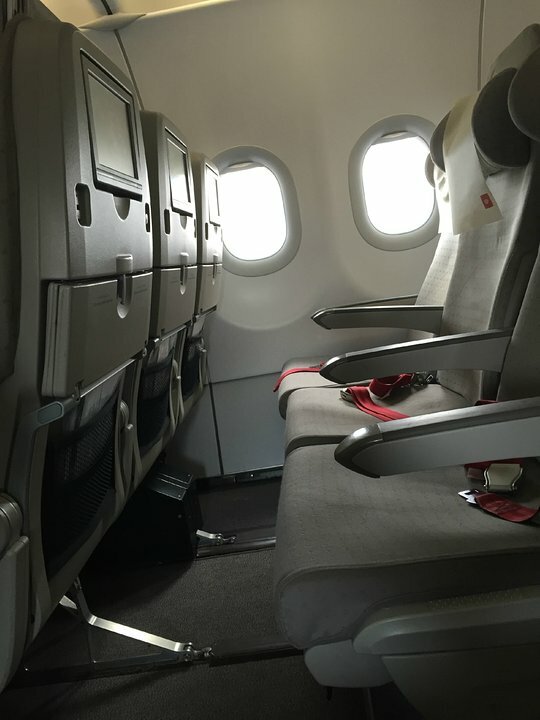 Royal Jordanian flies their version of Airbus A319 in a two class configuration with 14 Business Class recliner seats and 96 standard Economy Class seats. Great seat... It reclines to the back enough and has the nice legs pad with a place to put your feet. No electric sockets or wifi. The seat is facing the wall so you can also stretch your legs against it. Great seat- had no problem with storing my bag along the side of the seat in order to comply with safety instructions. The galley does not make alot of noise, and the seats are far enough from the bulkhead as to not feel cramped. Rather have a wall infront of me than a seat reclining towards me. Royal Jordanian flies 1 versions of Airbus A319.